The Chicago Bears kickoff the John Fox/Ryan Pace era tonight at 7 PM CT off Lakeshore Drive with an exhibition matchup against the Miami Dolphins. For those who haven’t had an opportunity to make the trek down Route 55 to Boubonnais, this is will be your first look at the run-heavy Adam Gase offense and the Vic Fangio 3-4 defense…Albeit watered down, but still a first look. The expectations for each year’s first preseason game are usually as follows. Maybe a series or 2 for the offensive starters. The first team defense may get a little bit more time as they are adjusting to a whole new scheme with players in new positions. Then it becomes time for backups and fringe players to show what they’ve got. Regardless, the players on both sides of the ball are going to carryout game plans from their respective coordinators for the first time, and that should be exciting for Bears fans. 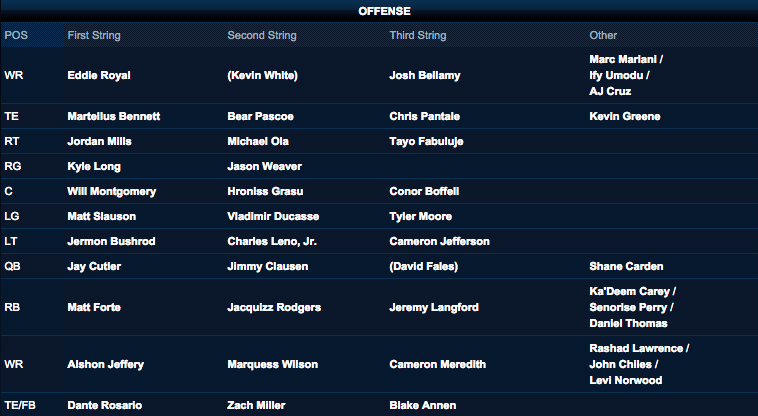 Wednesday afternoon, the Bears released their first unofficial depth chart on the team’s website. Here are the different phases for the 2015 Bears squad, and what to look for while they get to hit someone else for the first time this summer. Jay Cutler will start under center, as expected, with zero interceptions thrown all training camp. Gase has focused on running the ball in camp and playing to Cutler’s strengths which include rolling out of the box and throwing on the run. Cutler’s “see it, throw it” mentality works better when he can extend the play, and play-action should suit that better. After Cutler exits, it will be his backup from a year ago Jimmy Clausen and undrafted rookie free agent Shane Carden from East Carolina. Clausen saw time in 4 games last season and 1 start before being concussed. The preseason is like the backup’s regular season with an opportunity to instill some confidence that he’s right for the job…or the general manager will look elsewhere. As mentioned before, the emphasis of the Bears’ new offense will be on running the ball and Matt Fortesounds more than welcoming of that. In contract year, Forte would much prefer that mentality as opposed to the RB-record 102 passes he caught last season. No surprise that veteran Jacquizz Rodgers is the second string back, but Jeremy Langford will have a chance to showcase his speed, pass catching, and third down strength. Daniel Thomas is the only other proven back and has out-shined both Ka’Deem Carey and Senorise Perry in camp. The Bears seem set at the position for the time being, despite 1st round pick Kevin White trying to return from a shin injury. Alshon Jeffery is the clear #1 receiver with Brandon Marshall gone, and Eddie Royal fills a need that has been missing for year as the slot receiver. Anticipate Royal to see a lot of targets during the season if Jeffery commands double teams. With White on the sidelines, the stage is set for Marquess Wilson to try proving he can be a playmaker and also stay healthy. Josh Bellamy is a familiar name who will get plenty of snaps tonight, and return specialist Marc Mariani has impressed everyone in camp when he gets his reps with the first team. The Bears don’t have any fullbacks on their roster, so the tight end position gets two different slots on the depth chart. Martellus Bennett is the clear #1 while Dante Rosario gets listed first on the second line. Rosario will be in competition for second TE time against newcomer Bear Pascoe and 2014 preseason hero Zach Miller. Miller needs to prove he can make it out of the preseason in one piece, but could be an excellent red zone option if he can. The current starting offensive is the same as it was to break camp the past two seasons, with the addition of former Bronco Will Montgomery at center. Keep an eye on rookie Hroniss Grasu from Oregon, who ranked 2nd among centers in the draft and should get a lot of time with the twos. Jordan Mills is looking to bounce back from a bad sophomore season that was also plagued by injuries, but the massive Charles Leno will look to provide insurance to the tackle position. More than likely, Kyle Long will be mixing it up with somebody…because that’s what he does. It will be very different from what Bears fans have seen for the last decade and a half. There are no longer “defensive tackles” and defensive ends fill the 5 technique on the line. Slated as the #1 nose tackle is Jeremiah Ratlif, who is one of the few D-Linemen with 3-4 experience. While he is penciled in at the nose, he can also play DE. Eddie Goldman was highly regarded coming out of the draft from Florida State and was expected to make a run for a starting spot at either nose or DE. He should get plenty of snaps tonight, but will have to prove he’s in shape enough to handle it. Previously, he left the field early in both camp and OTAs because he wasn’t. I’m looking forward to how the two DL rookies from last year transition to end. Early reviews say Ego Ferguson was one of the most improved players from offseason workouts while Will Sutton seems to be struggling with the move. Jarvis Jenkins is slated as the other #1 defensive end opposite of Ferguson. Jenkins is the only other DE with 3-4 experience besides backend defender David Carter. He’s a better run defender but hopes to prove he can get upfield quicker to prove he can rush the passer in Fangio’s system. Cornelius Washington will be one of the most interesting watches tonight as he has hung around the roster for the past few years without seeing much regular season playing time. It’s funny seeing the two biggest defensive signees from last season not only in different positions now, but one slated ahead of the more expensive one. Jared Allen is currently the starter ahead of Lamarr Houston and both are trying to prove they can learn a new position. I have a hard time seeing either one drop back in coverage which is why I anticipate they are going to get more pass rushing snaps than anything. Purnell McPhee is this season’s big free agent signing and he describes himself as “violent”. Tonight we get our first look at how violent he can be for the Bears and how much chaos he can cause for opposing offenses. Sam Acho is set behind Purnell in the depth chart, but he’s probably a better OLB than both Allen and Houston. Willie Young will have the most to prove as he has had the toughest time changing positions. He’s always played a wide DE position and it has to be awkward playing without your hand on the ground when you haven’t done it for your entire career. No, you read that correctly. Shea McClellin the Bears starting inside linebacker alongside last year’s undrafted rookie free agent signee Christian Jones. Jones has always looked like a player who deserved to be drafted and given more respect, but McClellin is auditioning for his 3rd different position. This is the Shea-Train’s last chance to prove he isn’t a draft bust and so far he has shown Fangio this may be his natural position. If not, Mason Foster has plenty of experience and skill to fit in better. Jon Bostic has missed most of the offseason due to injury and is still catching up to learn the scheme and his position. The Bears secondary is currently their weakest position in terms of depth, and maybe talent as well. Kyle Fuller has a full year under his belt, one that saw a lot of success in the first month and disaster the rest of the way. The Bears hope he can emulate that first month for an entire season. Tim Jennings is a former Pro Bowler, but is also coming off a rough 2014 campaign. Jennings has always been best in man coverage though, so the scheme change should be helpful. Alan Ball was priority signing for Pace in the offseason and will get plenty of time to show why next to Tracy Porter. Many were surprised to see 2nd year safety Brock Vereen as one of the starting safeties, not so much of a surprise with Antrel Rolle. Ryan Mundy was expected to be one of the starters and will have to earn that spot beginning tonight. Keep an eye on the rookie out of Penn State, Adrian Amos, who was one of the best coverage safeties in the Big Ten a year ago. There’s not much to say about the Special Teams units other than the fact that they can’t be worse than last year’s. And on the cover of tonight’s program at Soldier Field is punter Pat O’Donnell. Follow along for updates and conversation on Twitter.